Gamete Glass is part of a series of blown glass sculptures. Their abstract forms recall the gametes, the reproductive cells that I call “cyborg gametes”, reinterpreted with laboratory test tubes. Gamete Glass was designed to generate sounds when activated by breath. Gametes are reproductive cells that can fuse with others. In this project, glass cells fuse through their audio DNA. We used sound vibrations recorded in a studio to create a palette of audio tracks that have become the genesis and matrix of the A Gamete Glass Tale project made later in collaboration with Romain Azzaro. 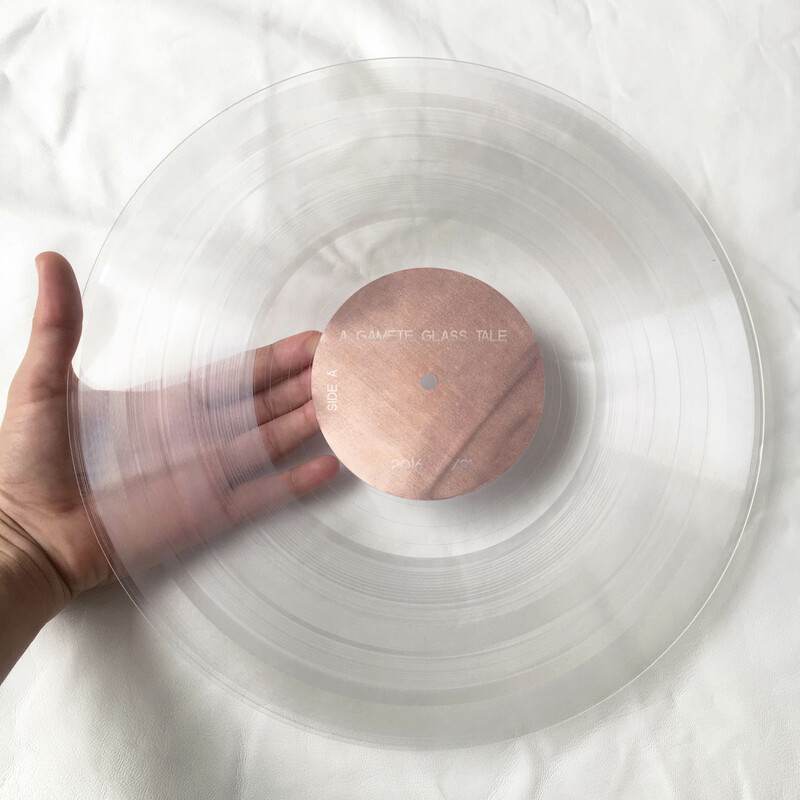 A Gamete Glass Tale is a vinyl record of sound compositions produced with the cyborg gametes in blown glass in collaboration with Berlin-based sound designer Romain Azzaro. Born at the dawn of the decade that saw the long-term implementation of modern computational technologies into our daily lives, raised in the decade that was synonymous with the shrinking and dematerialization of their physical media, the work of Jeanne Briand—born in 1990—reveals all the complexity and ambiguity of our relationship with technology, less as a mere instrument than as a way of being in the world. Primarily influenced by speculative fiction and science-fiction films, from Aldous Huxley to David Cronenberg, her imagination follows the futuristic sensibilities of her predecessors. Her imagination, or rather the texture of her esthetics. One of her most recent pieces, blown glass sculptures from 2010-2011, displays the organic roundness of the matrix. Their shape recalls that of the gametes, reproductive cells, joining her preoccupation with procreation, which recurs like a red thread throughout her work. One of her first projects was a series of blue uterus drawings. However, this is no celebration of the immemorial process of generation. Upon closer inspection, the sculptures are thorned with plugs and USB ports allowing them to potentially interact with their environment. Instead of nature, culture—and more precisely, technology—is at stake, all the way into one of the fields where human intervention is the thorniest. Jeanne Briand’s works are themselves cyborg bodies, both producers and produced. Once activated by the breath that created them, the sculptures emit sounds that vary according to thickness and their respective dimensions. The result is a soundtrack to the exhibition that gives these gamete-inspired forms their generative power. Recorded in a studio, blowing into the sculptures, adding water to them and a bit of percussion and reverb, the soundtrack is composed of quasi-sculptural cuts and juxtapositions. Glass, the material of test tubes, also shows a fundamental facet of her work process—reconnecting trans-esthetic sensibility with the materiality of artisanal techniques. Only in the uncontrolled, hesitant gesture that aims not for the finished form but for the process behind its trace, can the fully plastic libidinal charge emerge, and in turn produce unprecedented associations in the viewer’s mind, leading us into the concatenation of life itself—augmented or not.